high low | stesha rose. jeans // shirt c/o Shein // jacket (old - similar) // bag // shoes // statement necklace c/o BaubleBar // bracelet c/o Olive + Piper // lips: liner in "whirl" and lipstick in "brave"
Happy September 1st! You know what that means right?! PUMPKIN SPICE is available at Starbucks! I know, I know, basic as can be but I do NOT care at all. I didn't used to drink coffee until a few years ago, but then I slowly started drinking warm pumpkin spice lattes and then it gradually grew from there. So yes, happy day for me today! To bring in September I have a fall inspired look. 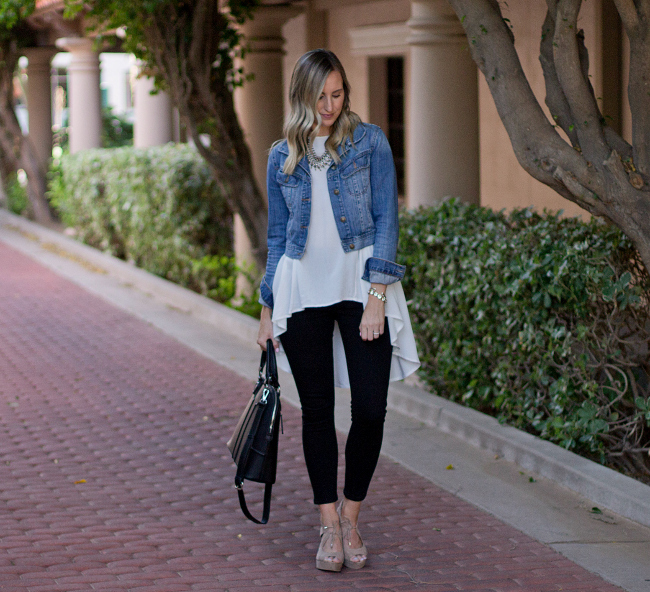 It is still a little too warm in Arizona for jackets so I have shown you how I would style this outfit two ways. 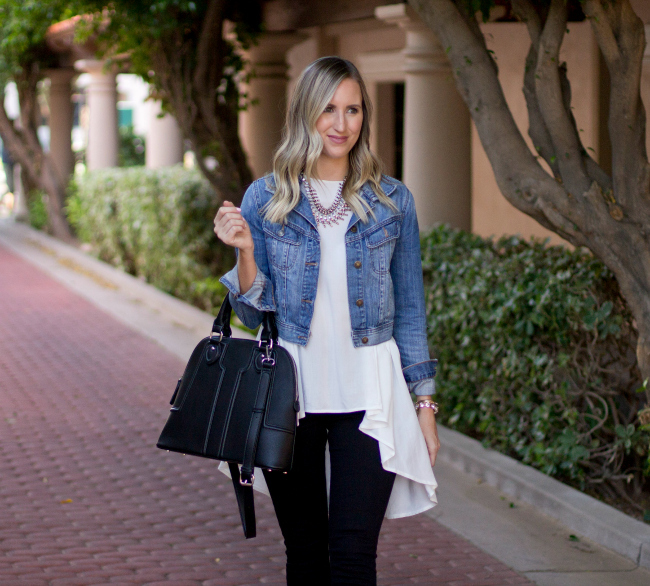 Denim jackets have and always will be a favorite staple in my wardrobe. 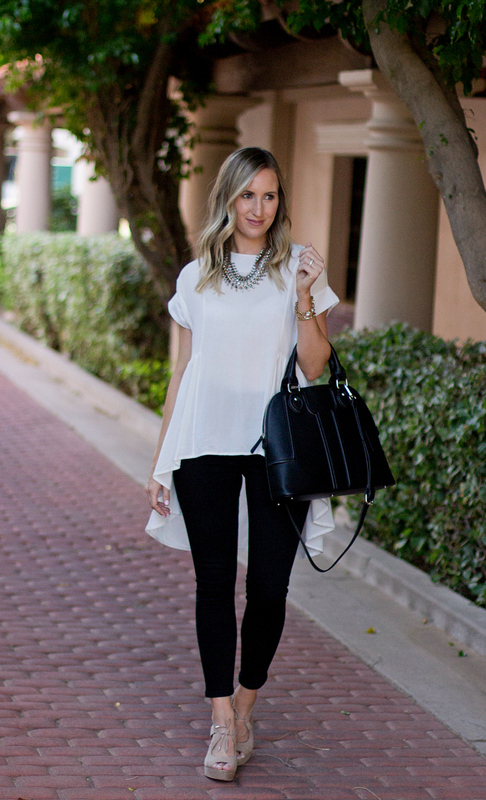 They seriously go with almost any outfit, so versatile and comfy.... win win! 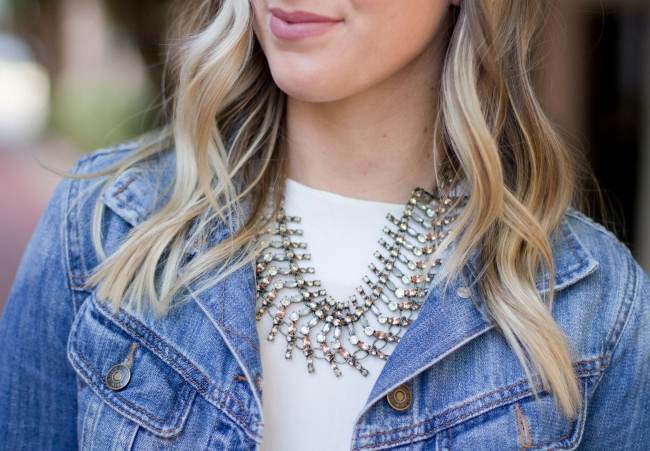 Also a Fall staple for me this year in this BaubleBar bib necklace. 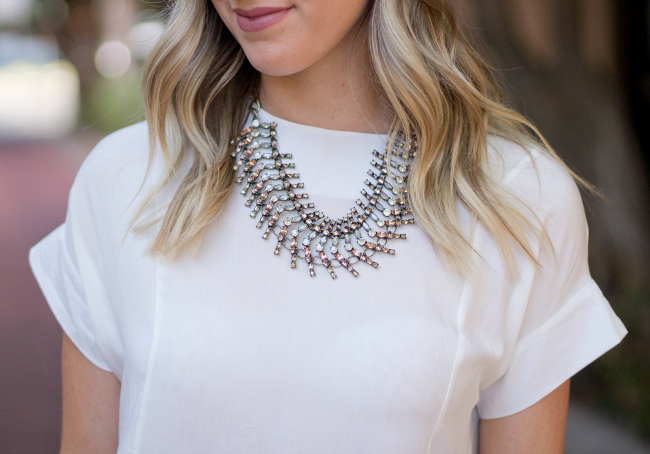 I have been on the search for the perfect neutral statement necklace that I could wear often. So many times when I am getting ready I will feel something is missing. Usually something small, but still something is missing and my fist go-to is always a necklace. I love this neutral necklace because it has the perfect mix black + brown so it will pair nicely with warm or cool colored outfits. This outfit is on point!!! I need a pair of those black high-rise pants. LOVE!!! You look wonderful, Stesha. Happy Fall! You look gorgeous and I need your top! 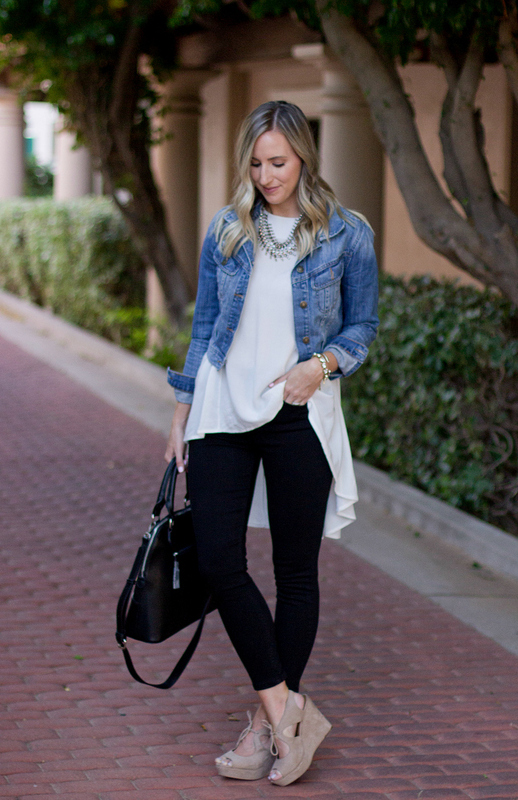 That top is adorable, and I love a good jean jacket! Loving that hi-low top! You styled it to perfection! 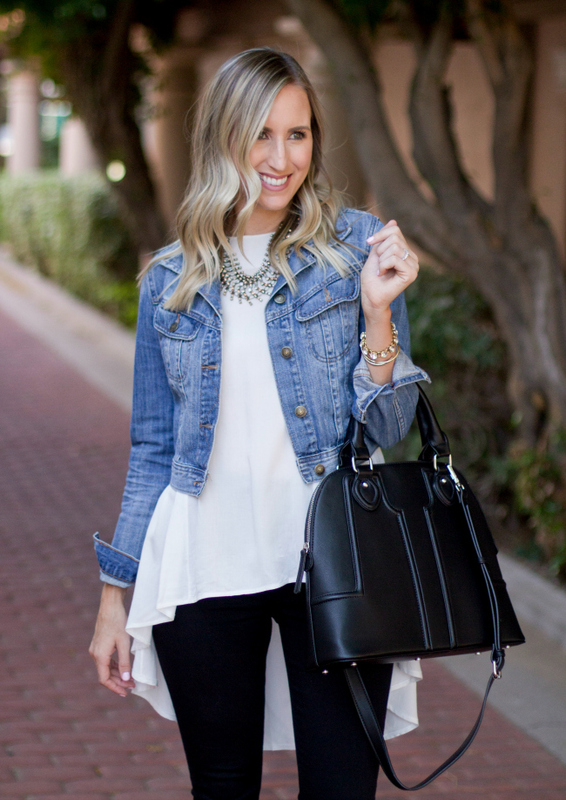 I adore your denim jacket and bag! 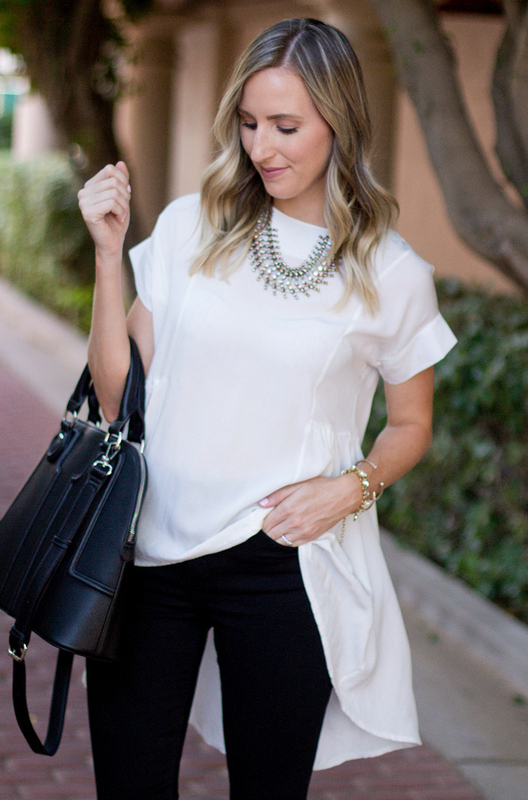 So chic and simple - the best combo! What a fun shirt! This outfit looks AMAZING on you! I love the way high-low stuff falls! Its so drapey and pretty! 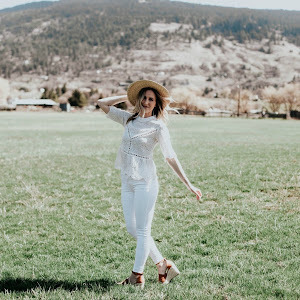 You can never go wrong with classic outfits, so cute!